Tasmanian whisky was recently profiled extensively to national and international audiences as part of Chinese President Xi Jinping’s historic visit to Hobart. Three of the State’s best known single malt distilleries were selected for inclusion on major event menus relating to President Xi’s visit, foremost of which was the inclusion of Hellyers Road Distillery’s Peated varietal on the Government House menu for Tuesday’s Presidential luncheon. The Government House menu, dominated by top quality Tasmanian produce, was heavily scrutinised by millions of Chinese people courtesy of blogs and websites administered by visiting Chinese Media. A bottle of Hellyers Road 12 Year was also one of three official gifts given to the President on behalf of the people of Tasmania. According to Hellyers Road general manager, Mark Littler his distillery was very excited with the prospects that may emanate from such valuable exposure. “We are already in detailed export discussions with the Chinese so we are hopeful this coverage will add further impetus to our export negotiations”, he said. 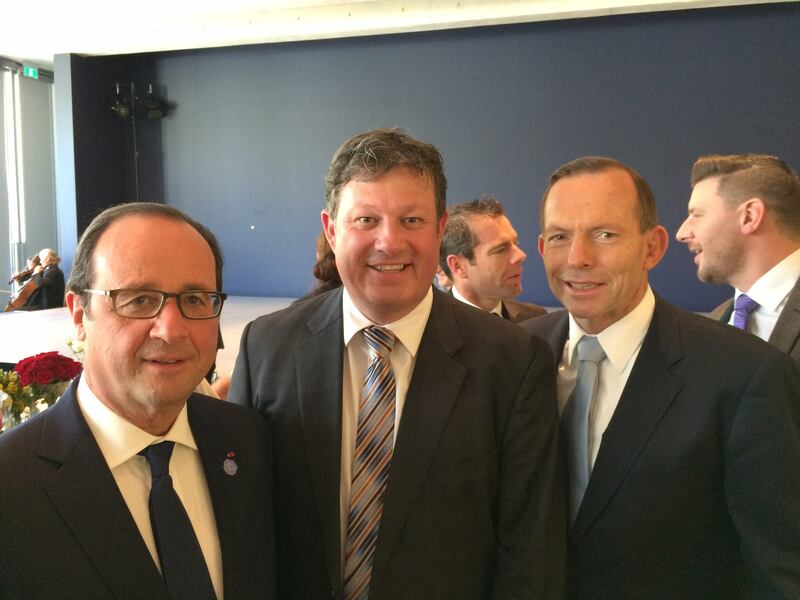 Not content with a busy week of Chinese events and deliberations, Mark Littler flew to Canberra for a Prime-ministerial luncheon in honour of the French President, Francois Hollande. Hellyers Road Distillery has strong ties with France through major European liquor wholesalers, La Maison du Whisky. Mark joined many Australian dignitaries, politicians, business and community leaders including former Governor General, Quentin Bryce and Tour de France winner Cadel Evans to celebrate Australia’s ties with France. 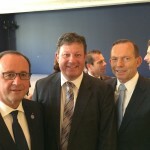 He was fortunate enough to be granted an audience with President Hollande and our own Prime minister, Tony Abbott. “It was a great thrill for me to meet such high-powered people and talk to them about our single malt whisky. President Hollande seemed genuinely interested in the growth of the Tasmanian Industry and was particularly impressed with Hellyers Road’s relationship with France, through La Maison du Whisky. The whole occasion was very exciting and quite humbling”, he concluded. While in Canberra, Mr. Littler also met with the U.S Ambassador to Australia. The U.S. Embassy is a strong supporter of Hellyers Road Distillery and serves its single malts each year at American Independence Day Celebrations held in Canberra.